Were you looking for Mephisto, the Diablo II act boss' stats? Mephisto, the Lord of Hatred is the eldest of the Prime Evils. 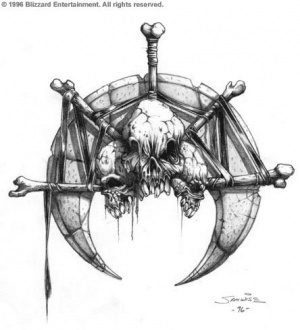 He is brother of Diablo and Baal and deals primarily with Undead creations. Only mentioned in the manual. Mephisto is presumed by some to be the most intelligent, strategic and analytical out of the three Prime Evils, but is speculated to be the weakest in terms of power. He is noted in the Book of Cain as the most cunning of the three evils, and is considered a more than capable tactician. He specializes in the creation of the undead, filling the corpses and monstrosities with hate for the living and unleashing them upon his enemies, as fitting for the Lord of Hatred. He could be taken as charismatic and possibly even amicable, were it not for the evil of his words and his demonic tone. Mephisto is known to be father of two demons: Lucion and Lilith. Mephisto's daughter was the lover of the rebel angel Inarius, and together they created Sanctuary. Mephisto's son was Primus of the Triune, a church at its prime during the Sin War with very strong connections to the Prime Evils. Both of Mephisto's children were heavily involved in the events of the Sin War, with Lilith being one of the core founders of the world of Sanctuary. Lucion was 'willed out of existence', leaving Lilith as being the only 'child' to technically still exist. The three Prime Evils in early concept art. At the end of the first Sin War, the Angiris Council dictated judgement against Inarius, Sanctuary and his abominations: the nephalem and the edyrem (children of the mating between rebel angels and demons). Mephisto's shadow appeared before the Angiris Council proposing a truce and a pact. Mephisto offered to let Sanctuary be untouched by either angel or demon to see what the children may yet become on their own for good or ill.
"We, like you, made false assumptions about this place, false assumptions about the creatures spawned by both our kind. But Sanctuary is much more than we envisioned! And we will let it grow and see where it leads, good or ill, untouched by either side." The Angiris Council didn't believe the word of a Lord Demon. However, Archangel Tyrael stepped forward and asked Mephisto if he was truly proposing a truce, in order to believe him, he had to cast his mark on a place of Tyrael's choosing. To this Mephisto agreed, with the condition he was given a prize for such a goodwill gesture. 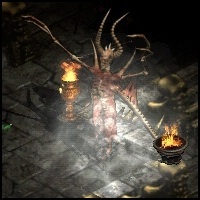 Mephisto in Diablo II, animated. Archangel Imperius nodded at Tyrael, in agreement to Mephisto's petition. Mephisto requested the Angiris Council to be given the rebel Angel Inarius to pay for the loss of his children: Lilith and Lucion; and the sealing of the truce. The Angiris Council, Mephisto and the three Sanctuary residents (Mendeln, Serenthia and Rathma) shifted location instantly. No longer were they at the Silver City, but on the vicinity of the Cathedral of Light. Tyrael signaled Mephisto to place his mark upon the point where the rebel Angel Inarius had preached to the masses of Sanctuary for centuries. Mephisto rose his hand and bit it to bleed his black fluids upon the place chosen by Tyrael. Afterwards, Inarius was given to Mephisto to be taken into the Burning Hells for eternity. Mephisto asked what would be done with the cavern and the find within -- referring to the Worldstone. Archangel Imperius said a new pact should be done about that. What this pact was is yet unknown. Mephisto agreed with Imperius that the edyrem were to begin at the beginning with their powers set dormant and their memories of the past events of the Sin War to be wiped from their mind. Mephisto requested the firstborn, Rathma and the other nephalem to be able to remember for they were few remaining and their day was at an end. 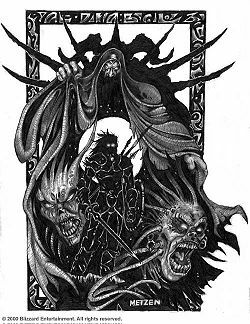 Mephisto illustration fan art by unknown. Millennia after this, the Burning Hells were still locked in the Great Conflict with the High Heavens. The humans' souls could be used by either side as an additional source of power, and thus angel and demon kind brought some of the battle to Sanctuary in stealth, trying to vie for the favour of man. This is also the Sin War. Neither side dared do it too openly, fearing the other side would notice and simply destroy the world. The amount of energy they could use sourced from their home realm on Sanctuary is also very limited, which means a full invasion would be needed. The Prime Evils thought out a plan to use angel Soulstones in order to directly access their home realm power on Sanctuary, laying the whole world under their feet in one blow. With the additional power from Sanctuary, they would be able to defeat the High Heavens. The corrupt angel Izual facilitated the idea, and the Prime Evils manipulated the Lesser Evils to throw the trio out of hell, banishing them on Sanctuary in spirit form, greatly weakened. The angels did not see it as a threat because they were so weak. The weakness was a lot more than the three had considered, however, and they were forced to possess a mortal body in order to keep from hemorrhaging power. With bodies they could consume human souls for energy, and storing it up to the maximum power of their host body. Their demonic essences also warped the bodies to grotesque mirror images of their true demonic forms. Their rampage was vast, but as the angels expected the Lesser Evils to launch their massive attack against the High Heavens, they withdrew their soldier angels from Sanctuary. Instead Tyrael gathered a group of mages who created the Horadrim to capture the demons in Soulstones, just what the Three wanted. Mephisto was the first Prime Evil to be captured, and the Soulstone used to hold him was buried in a vault beneath the Temple of Light in Kurast. One third of the Horadrim brotherhood took residence in the tomb awaiting the capture of the remaining two Brothers. With high casualties to the brotherhood, all of The Three were eventually captured. The original plan was to just take the Soulstone and use it to channel energy from Hell. When each of the Prime Evils were first captured they had been sufficiently weakened to not even be able to escape. Mephisto in his Durance of Hate. The full layout of Mephisto's Durance of Hate. However, after centuries of trying, Mephisto finally managed to overcome the powers of the Soulstone enough to influence and corrupt the local Zakarum priesthood. Mephisto made the use spells to shatter the Soulstone into seven shards, breaking the magical seal and freeing him. The six smaller shards were inserted into the left palms of six Zakarum archbishops by Mephisto, and they were ordered to bring him human sacrifices as nourishment and running their temple. The largest shard pierced the hand of the Que-Hegan who had replaced Khalim, known as Sankekur. The Que-Hegan is the highest divine authority of the Zakarum faith; Khalim had been killed due to Mephisto's inability to corrupt him. Mephisto used Sankekur's body to remain in Sanctuary, warping it as normally happens with possessions. He used his power over the Zakarum faith to send emissaries to the west, eventually bringing King Leoric to Tristram, and ending with Diablo being freed in the guise of the Dark Wanderer, who freed his brother Baal, and the three met up in Mephisto's Durance of Hate in Kurast. For years, the corrupted religious leaders of the Zakarum kept Mephisto supplied with information and misguided followers to carry out his plans of conquest. The three sent Diablo to reclaim Hell, and Baal to conquer the Worldstone. Shortly thereafter the group of adventuring heroes arrived, killed the corrupt priesthood and destroyed Mephisto, going on to destroy his Soulstone on the Hellforge, banishing him from the mortal realm permanently. The heroes also went on to kill Diablo in his own domain and Baal on Mount Arreat, although not in time to save the Worldstone from corruption. Mephisto in Durance of Hate. This is all truly just speculation and rumours that might or might not turn out to be true. It is thought that Archangel Auriel and Mephisto might have been lovers. Some different arguments support this hypothesis. When the Kiss of Mephisto (aka Blood Marble), the stone that resurrects Morlu indefinitely is first mentioned in the Diablo: The Sin War trilogy, the name was explained to be because it was originally a gift for someone else, other than Lucion. Since it's the sort of kiss he does not approve of, it could be that it's the sort of kiss a father does not give his son. With that logic it also seem unlikely it's the type of kiss a father gives his daughter, like Lilith. If it was not for Lilith or Lucion, then Mephisto must have been involved with someone else. Tying in with his wink above, it could have been meant as a gift to Auriel, but for one reason or another instead was used to resurrect Morlu. Mephisto has only been present in Diablo II and the Diablo novels so far. Mephisto was not present as a character in Diablo III. His existence only comes from the game story indicating that he is one of the seven souls to be trapped in the Black Soulstone. However, his minions (such as the Sin War era Morlu), like those of the other prime evils, were present in the High Heavens. In Diablo II we meet Mephisto in the temple city of Kurast, where he has managed to turn the entire population into raging religious fanatics, completely corrupted. The local population fight with their lives to stop the approaching heroes from reaching Mephisto and release his control on the population by destroying his Compelling Orb. 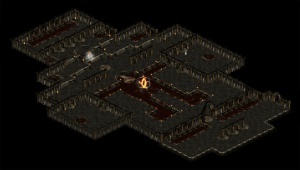 Once killed, the players takes the portal and travel into Hell to kill Diablo before his powers recuperates. 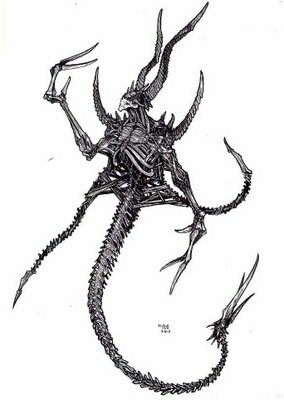 Mephisto is not featured in Diablo I's gameplay, but is mentioned to a great extent in the Diablo I Manual, and the creatures you fight are said to be partly sent from Mephisto's realm, as well as Baal's and Diablo's. The name Mephisto comes from a variation of Mephistopheles, an alternative name for Satan, just like Diablo is another name for Satan. This page was last edited on 24 November 2017, at 18:22.